It's been a bitter cold day here in northern Vermont, with the temperature lingering between 9 and 12 degrees F, and a stiff wind generating subzero wind chill effects. Good thing we've got plenty of books here, for an indoor day ... especially one with Leighton Gage's newest Brazilian police procedural, PERFECT HATRED. Gage's sixth title to feature Chief Inspector Mario Silva also includes Silva's nephew Hector Costa, who partners with Israeli-trained Danusa Marcus to investigate what's clearly a terrorist bombing during an enormous political demonstration of some three hundred thousand people. Well planned, executed almost perfectly, the bombing would be a lot harder to crack if a local policeman hadn't needed to purchase a "sorry" gift for his wife, ducking into a shop just after seeing the about-to-be perpetrator and observing some odd details. "One of those headscarf things" is the expected garb of the bomber -- but the baby involved, with skin of a different color compared to the adult in the headscarf, sends the investigation into high gear. "Go back to the beginning of the tape," Silva said. ... "This time, pay attention to the expressions on [the shooter] Cataldo's face." "Why? What am I going to see?" "When he approaches [the victiom] Plínio," Silva said, "Cataldo looks nervous, but determined. He's grim, but his jaw is set. After he shoots, his expression turns to one of horror." "No, it doesn't. He drops his gun hand to his side and stares." It gets even more complicated and surprising. Silva's caught the scent of something peculiar behind the face of this crime, and the politics of the victim's widow, Stella Saldana, leap into view quickly. Soon there's a cresting wave of money and inheritance to motivate the crime, too. Readers who already know Gage's series won't be surprised when the two investigations begin to connect in odd ways. Gage also moves the action to a border setting where new forms of crime flower. 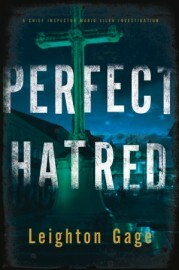 Intense action, swift changes of direction, and Chief Inspector Silva's determinedly anti-political team make A PERFECT HATRED a page-turner with fascinating revelations of place and politics, not to mention modern terrorism and its manipulations. One particular pleasure of following Silva and his nephew is that advances in the detection here are rarely accidents; they are instead the satisfying results of pushing for more data and more connections. And the Author's Notes at the finale are almost as startling as the plot twists in terms of revelations. A quick side note: Gage's series has often dipped into the human stew of Brazil's favelas, the ridge-top city slums of Rio De Janeiro where crime foments and housing is so substandard that there aren't even addresses for mail delivery. It's been fascinating over the past few months to learn of the changes in the favelas, perhaps propelled by Brazil's preparations for hosting the 2014 Olympics. Look here for an overview -- and, knowing how Gage's crime fiction accentuates Brazil's reality, I'm bracing for a return to that earlier setting, wondering how Chief Inspector Mario Silva and his team will adapt. Inspector Irene Huss is already well known in Sweden, where there are films and DVDs of the detective fiction in which she stars. THE GOLDEN CALF is the fifth in the series translated, this time by Laura A. Wideberg, and brought to the United States by Soho Crime. Last night's headlines had been huge: Two well-known financiers killed! and Golden Calf murdered! Kajsa had mention to [Huss] that the press often called Philip Bergman "the Golden Calf." His name came from his phenomenal ability to attract investors without needing to lift a finger. Everyone had fought to have the chance to dance around the Golden Calf. Thanks to Irene Huss's "experience, intuition, and stubbornness," the investigation quickly grows to include another financier, this one simply missing, and a Paris location that may play a role in whatever dotcom financial fiddling is being covered up by killings. When Huss gets a chance to go to the City of Lights, violence travels with her. Several online references mention that Tursten -- a dentist turned crime novelist in midlife -- could be called a Swedish version of P.D. James. If that's what it takes to start you on this intriguing series, go for it. But a better comparison is to Donna Leon, whose Venice series features Commissario Guido Brunetti tests his intuition against that of his wife Paola, as well as the office assistant Signorina Elettra. The steady good sense and straightforward attentiveness of the couple, and their sturdy mutual affection (decorated with mouth-watering description of their meals), give enduring charm to Leon's series. In the same way, Tursten crafts a balance, sane image of Huss's marriage to Krister, a chef who cooks wonderful meals for her and their twin daughters. In each of Tursten's crime novels, there's a thread that involves this "normal" family -- from daily stress, to teen angst of the daughters and the risks they sometimes take. 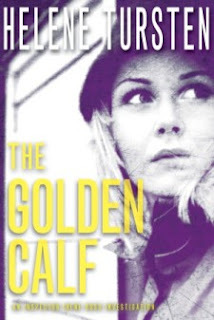 In THE GOLDEN CALF, the twist is Huss's growing awareness of the signs of aging in herself (a bad knee, for instance), coupled with the slowly growing awareness that something's going wrong in her work partner Tommy's life. Though Tursten's series doesn't explore the gore and darkness of some other Scandinavian series recently translated to English, Huss confronts the ugliness of violence as she "follows the money" to unravel the crimes. The caring comfort of her family balances the book, and makes it clearer that even the "clean" crimes of financial cheating lead to deadly disasters -- made all the more graphic by comparison with how ordinary people are blessed with family and home. There's no need to read the other four translated Tursten books before this one (Detective Inspector Huss, The Torso, The Glass Devil, Night Rounds); the series is satisfying, though, and the fact that there are six more still coming through translation is even better to contemplate. One last note: I'm not wild about the translation on this one -- the dialogue is stiff, and the sentence rhythms often awkward. But in some ways, this just accentuates the "foreignness" of the setting, and doesn't interfere with enjoying a great character and intriguing plot twists. Looking for dark, intense, hard-boiled thriller reviews? Or complex political suspense laced with social commentary and poison? This is not your pair of reviews. Click on a different post (see the search box at the top left of this page? type in Olen Steinhauer or Taylor Stevens or Lee Child or even S.J. Rozan, who skirts the darkest areas while laying out a complicated detection plot in New York's Chinatown and ... wait a minute, you're distracting me). Let's talk pets and plots. In an unusual twist, Sparkle Abbey (pen name for two authors and their rescued pets), bringing out a fourth mystery in the Pampered Pets Mystery Series, sent a review copy of Book 1 here recently. 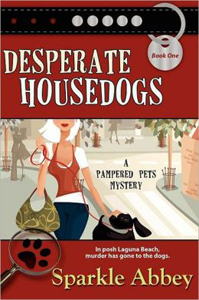 DESPERATE HOUSEDOGS scared me off at first -- what if the dark parts involved dead dogs or cats? This could be a heartbreak (and gross). Well, I was wrong to wait so long. The entirely normal dogs in this first Sparkle Abbey murder mystery do not get stalked or wounded. On the other hand, when pet therapist Caro Lamont pays a call on one of her California clients in posh Laguna Beach, the two German shepherds on hand are majorly acting out. It's actually the second day they've spent barking nonstop at the patio doors, even though there's nobody out in the yard, and Kevin, their owner, is understandably upset. Caro's intervention, showing Kevin how to increase his dogs' silent times through carefully timed rewards, lowers the volume some. But when Kevin is murdered soon after, it takes Caro a long time to realize the dogs' behavior might have been an understandable response to a threat. Admittedly, there are distractions, like Detective Judd Malone, on the case. Let Caro fill you in: "He hadn't offered a badge or an ID and though I truly didn't think serial killers looked like Brad Pitt's brother and stalked pet therapists, you can't be too careful." Then there's wealthy Sam, who's offering the kind of dating experience that will get Caro's nagging mother off her back for a good long time. But none of that prevents Caro from nosing around the scene of the crime ... and getting herself into trouble with the already mentioned "hot" Judd Malone. Caro's persistent nosing around eventually tips the case wide open, and DESPERATE HOUSEDOGS is a brisk, lively read, full of socially climbing merriment, suspicious characters, and unexpected discoveries. I enjoyed it; the sequels are GET FLUFFY; KITTY KITTY BANG BANG; and coming this summer, YIP/TUCK (dare I guess it features plastic surgery?). If you're already a fan of Southern California mysteries, social entanglements, and gutsy but cute women, put the Sparkle Abbey Pampered Pet Series on your shelf. Now we segue into a mystery that really couldn't be more different: TRUE GREY by Clea Simon, fifth in Simon's Dulcie Schwartz series (after Shades of Grey, Grey Matters, Grey Zone, and Grey Expectations). Here's a spooky and often danger-filled exploration of the murderously manic jealousies among scholars seeking their reputations at a college campus. The book opens with a nightmare: a murder of a scholar who's trespassing on Dulcie's terrain, where new discoveries around an early Gothic novel are about to make Dulcie's academic reputation, not to mention her first published book. Except that the mysterious arrival of Melinda Sloane Harquist turns everything upside down. This new scholar on campus has some unexplained power over the Dean that actually cuts Dulcie off from her own research material, and more. So when Dulcie dreams Harquist has been brutally murdered, it's a nightmare that's far too real. And she soon discovers that the dream is only a taste of what's really happened. Here's a murder that looks like it could easily hang the intrepid investigator. Dulcie gasped, unable to breathe. The pounding in her head threatened to take over, the noise of the fly a deafening roar as Dulcie released the statue and it crashed, once again, to the carpet with a deep, dull thud. Dulcie didn't hear it, though. Didn't register the voices below her either. The last words she'd heard echoed through her mind -- warned, she'd heard. Three times warned. Mr. Grey had been trying to help her. Simon is currently offering three series of mysteries, and I'm definitely a fan of her pet noir books involving animal psychic Pru Marlowe (and looking forward to the upcoming third in that series, Parrots Prove Deadly) -- Pru wrestles with the discomfort of realizing that the animals she helps take care of have actual voices (some of them not at all sensible, and all of them distinctively geared to animal hungers and instincts) and I can identify. Simon paces her action tautly, and her protagonists are feisty, intelligent, and skeptical. I like them! That said, I'm more resistant to buying into the voice of a ghost cat, talking to another cat, talking to a person ... but if anybody can get me into this form of "pet paranormal," it's Clea Simon, and I'll keep on reading her books. If you've always suspected your cat really knew more than she or he was letting on, you'll savor these, too. US cover, left; UK cover, right. Last weekend's New York Times Magazine interview with medical suspense writer Jodi Picoult showed the author giving a tough set of responses to questions about gendered fiction. Challenged by the term "chick lit," she didn't just say it's not what she writes -- she reminded the interviewer that 47% of her readers are male. It may not be well known that a huge proportion of Lee Child's readers of his Jack Reacher series (called "manbooks" in one recent review) are women. But it's true. In fact, the most spirited discussions I've had of Jack Reacher's personality, physical appearance, and actions -- especially in the context of the recently released film that placed Tom Cruise in Jack Reacher's shoes -- have been with a woman reader who lives about ten miles from here. Petite, immaculately groomed, highly educated, she latches onto, enjoys, and reconsiders every one of Lee Child's thrillers that feature the big tough former MP as he interferes in malicious crime and asserts his own form of justice. Why do women connect with Jack Reacher so intensely? I hope a few of you will consider commenting to share your own view. Mine is: Jack Reacher is the "me" that I'll never become, but would like to think lives at the core of me: competent, independent, reluctant to hurt others if it's not necessary but ready to do so (in the most effective way) if it's necessary to defend the people I care about. 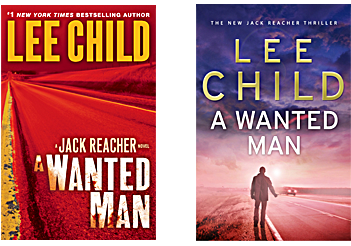 And that is the conundrum of Reacher, one vividly portrayed in A WANTED MAN (US release Sept. 2012): He's the last person you'd want to pick up when he's hitchhiking, especially as this book opens -- he's got a broken nose, swollen grotesquely and patched temporarily with a makeshift bandage of silvery duct tape. In fact, you've got to wonder why a car with three passenger already -- two guys and, in the back seat, a nearly silent woman -- would stop to give him a ride in the middle of the night, at an interstate highway cloverleaf. Except, of course, that as readers, we already suspect the people in the car have something to do with a vicious killing we've already "heard about." But Reacher doesn't know that ... and as he starts to tune in to how dangerous the two men are who've taken him into their car, he's also wondering what Karen Delfuesco is doing in that back seat, and gradually realizing her courage and initiative. There we are, back in the classic Reacher grab-your-heart situation: He's a walking weapon of mass destruction, even when unarmed. But he's also quick to perceive and appreciate the different forms of courage around him, even when they come in petite female packaging. No wonder we women readers treasure him. It's not just that he can even the odds in a fight with evil; it's that he values "our" contribution to that fight, whether or not we know and use martial arts. A WANTED MAN is a nonstop action thriller, and Reacher's stats add up rapidly, once he asserts control of his own actions. At the book's opening, he's hitchhiking toward "a woman in Virginia" -- and those who've read Reacher 15, Worth Dying For, know something about her and why Reacher believes she's someone he needs to meet, as he fights for independence and justice. Although he'll tangle with possibly corrupt -- and definitely dangerous and annoying -- federal agents, and with a threat so large and international that it's worth the attention of the Department of Homeland Security, every moment that Reacher invests in the situation that's enmeshed Karen Delfuesco is a moment of deferring his larger goal: getting to that woman in Virginia. Loyalty: that's another reason Jack Reacher calls us to bond with him, at least in the pages of a Lee Child thriller. I couldn't put this one down for long, even though there were long thoughtful passages mixed into the consuming pace of action. The way that each connection with an old friend puts that friend's life, as well as your own, into perspective, A WANTED MAN adds to our connections with Reacher and his quest. Thank goodness, we know there's another book coming. NOTE: Watch for more reviews this week, as I catch up during a (very slightly) slower few days of the "day job." I expect to compare several of this week's books with A WANTED MAN. You have 24 hours to grab your copy and think about it, or pick one up if you don't yet have it. FOR REFERENCE: There's a downloadable list of Lee Child's books here: http://leechild.com/books. Reacher #16, The Affair, was a prequel.